MyBB Hacks / Modifications / How to add a new Input Field Type? How to add a new Input Field Type? 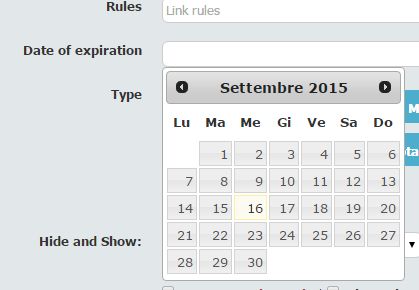 I want to add a new Input Field Type, specifically I want to add a calendar-style date picker. Does anyone have any hints how I would go about this? RE: How to add a new Input Field Type? A friend of mine who uses xThreads was messing about with this - she did get quite far with it as I recall, but I think it was a little buggy :/ I have pm'd her to ask if she can help. @nier3 - I dont know if you need the line <script src="//code.jquery.com/jquery-1.10.2.js"></script> because you are already loading jquery in the headerinclude. No need to increase load times if it is compatible with jquery-1.11 which is what mybb uses. Thank you Lee, without that script still works. Anyway I have to edit the post, because that code works with string date and if hansolo wants only a datepicker on date all that edits doesn't need. This should works without too changes. When you add date in newthread and edit date in editpost still you'll have US format date (yy/mm/dd) but patience.. "he who grasps at too much loses everything"
Also (if not saving it as string), maybe it is better (in my opinion) to set the Underlying Data Type to Integer. Good improvements -I had forgotten about post preview and drafts. Yea, I think it was the sort that Nier3 was after? Since 1.8 uses jQuery, in my opinion, it is a bit easier to customize the input field (there are many js plugins use jQuery). maybe we can use color picker.